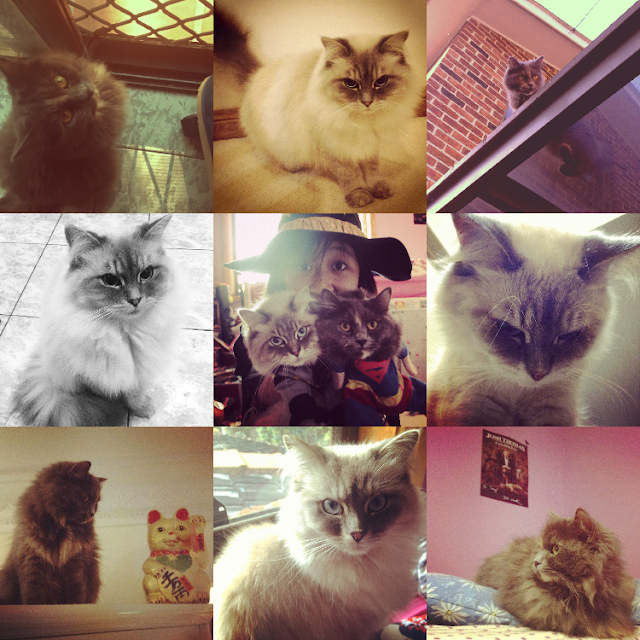 Cat at Heart by Tanya: Catstagram. Cats and Clothing. It is well known that I am quite fond of clothes. Clothes (and makeup) are a girl's closest companions. But what about the cats part? Why did I choose to name my blog catsandclothing? Meet my two best friends Tiger and Totoro! Tiger is the poorly named, white beauty while Totoro is the rebellious, fluffy grey cat, named after the oh so famous My Neighbour Totoro. They are of a Persian/Ragdoll breed and they are sisters. They are also my life. Even though I've only had them for almost two years, I can't imagine what it was like without them leaving cat hair all over my school uniform, jumping onto my bed in the middle of the night or pulling a Puss In Boots look when I'm having dinner. Everything they do is AWWWWWWW-worthy and I just can't help but smile when they're around. This quick post has been full of cheese and cats. I hope you don't mind but to me, my cats are supermodels in cat world so I just wanted to show them to the world!!!!! Hehe if you have any cats yourself, PLEASE leave them in the comments below so we can have a little cat obsession moment! x BYE! How cute! Wanna follow each other? visit my blog and let me know! They're gorgeous :) I have a persian (Missy) who is adorable, I LOVE cats too! beautiful cats by the way! Cats! Can't live with them can't live without them! I love animals with clothes. AAH I love that you named your cat Totoro!!! Your cats are sooo cute! Your cats are adorable! I have one myself and actually his name is also Totoro! what are the odds? they are all adorable ! awesome blog, love the layout! and the title is hilarious. i'm your newest follower and would love a follow back! the pictures are so cute *-* your blog is very lovely and interesting. follow? imm glad if you visit my blog, too <3 keep in touch!